Proposed construction of Bulacan Aerotropolis in Manila Bay threatens 700 families in the town on Taliptip with displacement and loss of their fishing livelihoods. 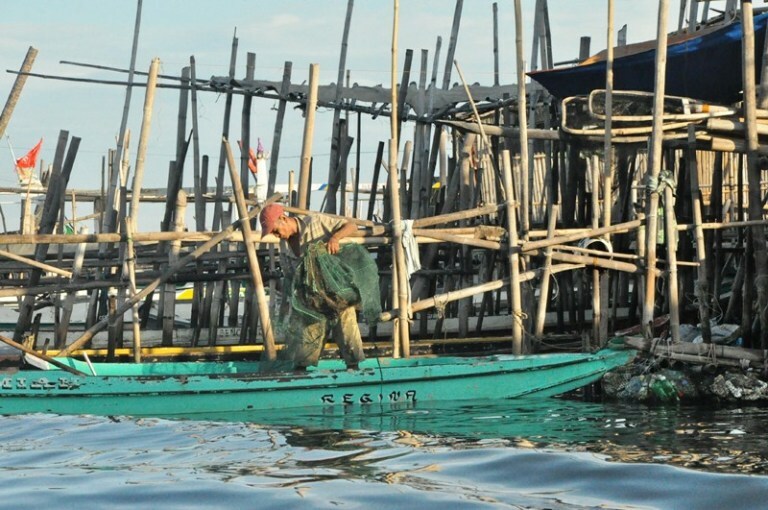 Thousands more fisherfolk and salt-makers would be affected by land reclamation. A proposal for a massive airport and airport city complex, an ‘aerotropolis’, in Bulakan, Bulacan province, Manila Bay was reviewed by the Department of Transportation (DOTr) in February 2017. In April 2018 the Investment Coordination Committee of the National Economic and Development Authority (NEDA) of the Philippines approved the Bulacan Airport proposal. Fisherfolk and residents in Bulakan town called on the local government to study thoroughly the possible impacts on their livelihoods, particularly in the town of Taliptip. The project would be built on their fishponds, under threat of being ruined with soil piled on top of them. The Chair of Barangay Agriculture and Fisheries said they would fight for their rights and continue to oppose construction of the aerotropolis in their area. Residents also expressed concerns over land reclamation blocking the flow of water from mountains leading to flooding in Bulakan and neighbouring communities . A 16th April 2018 a video shows a few seconds of a protest march against Bulacan Aerotroplis, with a banner reading AEROTROPOLIS NAKAMAMATAY! HUWAG PAYAGAN! (translated into English - AEROTROPOLIS – DEADLY! DO NOT ALLOW!) . A video by UCAN, the Union of Catholic Asian News inverviews residents of the village of Taliptip and seven other areas at risk of being affected by the project. At least 700 families face displacement. They make their living from selling their fishing catch in a nearby town and from making fishing nets. Their income is low but life is good and they do not want to leave. A woman who has lived in Taliptip for 43 years worried for the future of her children and grandchildren. They were not informed about the airport plans and had been told they will be relocated, but not where, or how they might make an alternative livelihood. Local communities resisting loss of their homes and incomes for the airport project are being supported by environmental and church group . Leon Dulce, national coordinator of the Kalikasan-People's Network for the Environment (KPNE), writes that the Bulacan aerotropolis plan is being pursued aggressively and was kept hidden from Taliptip residents until news broke of President Duterte's approval of the project. The seas surrounding Taliptip support the livelihoods of about 5,000 fisherfolk and salt-makers, who face being displaced for the project . A fisherman from Sitio Kinse, an island community in the midst of the mangroves along the shoreline said: "So long as the sea is here, there is hope … What will we fish if all this were turned into cement?" Fisherfolk take care of mangroves, a vital habitat for many bird species including egrets, terns, kingfishers and swallows, along with shellfish living among its roots. 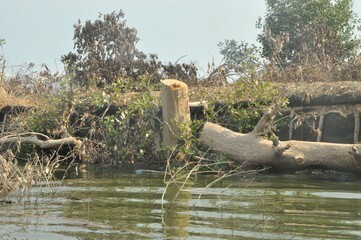 At the beginning of May there was a 'massive mangrove cutting spree' in Taliptap, reportedly undertaken by SMC, possibly without the required environmental clearance and thought to be connected with Bulacan Aerotropolis . National fisherfolk alliance Pamalakaya opposes the new airport. Chairperson Fernanado Hicap said the project will cause environmental disaster in Manila Bay; destruction of marine ecosystems would threaten the livelihoods of more than 20,000 fisherfolk in Bulacan and neighbouring towns. Hicap also lambasted the broader Build, Build, Build (BBB) infrastructure development programme that the new airport is part of, for selling coastal waters and public lands to large developers and foreign investors. Constructing an airport in Manila Bay would require extensive land reclamation works, creating new land from the sea and wreaking destruction on fishing grounds. Land reclamation for the Bulacan airport project is likely to impact not just on the town of Balakan but on the neighbouring towns of Hagonoy and Paombong and the city of Malolos. Environmental groups joined forces to protest Bulacan Aerotropolis. A study conducted by University of the Philippines professor Devralin Lagos cited a study which revealed that residents of Bulacan were not consulted or informed about the possible impacts of the project. People’s Network for the Integrity of Coastal Habitats and Ecosystems (People’s Niche) launched a campaign to oppose massive infrastructure projects including the airport project. On 14th August AGHAM (Advocates of Science and Technology for the People) called for donations of food relief, medicines and construction materials for repairing houses for the fishing community of Taliptip. AGHAM estimated that 64 families had lost their belongings in heavy rains and high waves, linked to removal of about the mangrove trees which they said paves the way for an aerial survey for the 2,500 hectare Aerotropolis. On 19th August 2108 it was reported that more than 653 mangrove trees along the coastal area earmarked for Bulacan Aerotropolis had been cut, the top of the trees removed. The Bulacan director of the Department of Environment and Natural Resources said that the mangrove trees had been pruned without permits for local authorities but that the evidence did not point to the project as the reason for the damage. Project Details A mega-airport is planned, with six parallel runways and initial capacity for 100 million passengers annually, more than triple the capacity of the existing main Manila airport, Ninoy Aquino International Airport. With a budget of P735.63 billion (US$14.2 billion) Bulacan Airport is the country's most expensive transport project to date, by far the most costly of eight infrastructure projects approved as part of the Build, Build, Build (BBB) programme on 25th April by the National Economic and Development Authority (NEDA) Board, chaired by President Rodrigo Duterte. San Miguel Corp (SMC), the Philippines' biggest company by revenue - a conglomerate with interests spanning infrastructure, real estate, mining, petroleum, power and food & beverages - is set to build, operate and maintain Bulacan airport and aerotropolis. The plan spans 2,500 hectares, comprising 1,168 hectares allocated for the airport and 1,332 hectares for an adjoining 'airport city'. SMC's unsolicited proposal to build Bulacan Airport, revealed after scrutiny by the Department of Transportation in November 2017, featured additional SMC projects, in the form of the obligatory surface transportation network that is inherent to the aerotropolis development model. An SMC-built expressway linking the airport to the North Luzon Expressway is planned, which would in turn link to SMC-backed Metro Rail Transit Line-7. By the time NEDA approved the Bulacan airport proposal in April 2018 the expressway project specified a revenue stream for SMC, an 8.4 kilometre airport toll road. The Bulacan Airport proposal will be reviewed by the NEDA Board and an inter-agency committee before it enters the Swiss Challenge stage whereby other firms can submit counter-offers which the original proponent has the option to match.